Easter Island is a remote, though uncharacteristically large, island in the South Pacific 2,237 miles west of Chile in South America, to which it now belongs politically. The natives of Easter Island, a Polynesian people, refer to their island as Rapa Nui. Europeans refer to it as Easter Island because the Dutch accidentally encountered it on Easter Sunday, 1722, the day of first European contact. Easter Island is triangular in shape and roughly 64 square miles in size. At one time Easter Island was home to as many as 7000 inhabitants. The Easter Islanders had arrived from the east through typical Polynesian technology: boats equipped with outriggers for stability. Using the massive trunks of dense old growth palm forests to build canoes, the people lived on fish and the harvest of the gardens that gradually replaced the forests. They'd brought chickens (and, accidentally, rats) with them from the east, and they build large chicken houses in various places from native stone. Over time a mysterious cult (the Moai carving cult) arose that led to the construction of many iconic statues of elongated, abstract human heads made of stone and weighing many tons. The making, moving, and erecting of these statues required a substantial fraction of the island's economic productivity. Many trees were felled to serve as levers and rollers to move these stones to various sites and erect them. Eventually (circa 1700 AD), the Easter Islanders exhausted their forests, could build no more canoes, and overshot the food growing capacity of their garden plots. A famine and war broke out, and the population crashed to a couple thousand people at most. This happened sometime between the first and second contact with Europeans. Warfare had led to the deliberate toppling of all the statues by the time of second European contact. 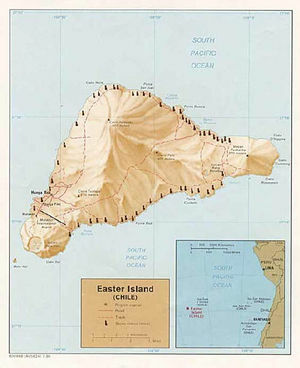 In modern times, Easter Island is deforested and depends on support from Chile as well as tourism for its local economy. In his book Collapse , Jared Diamond has cited Easter Island as a cautionary tale for what happens when a society foolishly squanders its natural resources without regard for the future, a process that admittedly happens much faster in the restricted case of an island. This page was last modified on 17 February 2017, at 11:52.